Rent motorcycle jackets, gloves and helmet gear. Kelly's Cycle Centre now rents genuine motorcycle and scooter gear for men and women. Take your motorcycle rider training course with confidence and most importantly dressed for safety. Take your M2 motorcycle license test in style. Rental period is Thursday to Monday for weekend rider training courses. Pick up your motorcycle gear at Kelly's Cycle Centre on Thursday and return to us by the following Monday. Late returns may be subject to additional charges. Helmet, jacket and gloves fitting and gear pick-up is done in our store. Contact us for motorcycle gear rental. Rental gear is brand new at the beginning of each riding season and cleaned after each customer use. 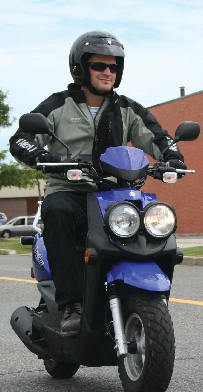 Helmets, motorcycle jackets and gloves have an proper safety rating for street motorcycle and scooter riding. All motorcycle gear is replaced at any sign of damage the may compromise its function. Damaged or very dirty gear may be subject to additional repair, replacement or cleaning charges. Get outside and ride.